Constantine I, King of the Hellenes (August 2, 1868 - January 11, 1923), ruled Greece from 1913-1917 and from 1920-1922. Born August 2, 1868 in Athens, he was the eldest son of King George I and Queen Olga of Greece. As crown prince, Constantine was instrumental in the organization of the 1896 Summer Olympics, appointing a committee to prepare Athens for the Games and keeping a close watch to ensure that their tasks were completed. He succeeded to the throne of Greece on March 18, 1913 following his father's assassination in Salonika. 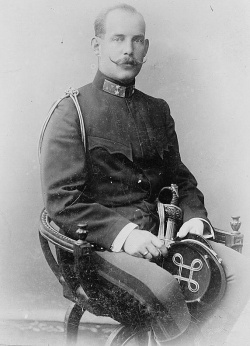 Prior to the start of World War I in 1914 Constantine, as Crown Prince, led the Greek forces during the successful Balkan Wars of 1912-1913. Having been educated in Germany, having served in the Prussian army and married to Kaiser Wilhelm II's sister, Sophie (in 1889), Constantine's sympathies lay more towards the Central Powers than to the Triple Entente once war broke out. Constantine was faced with the difficulty of determining officially where Greece's support lay once war was underway. This was complicated by the fact that his government, led by Eleftherios Venizelos, was pro-Allied and the fact that the Entente Powers were in possession of naval dominance of the Mediterranean. Constantine's sympathies emerged during the Allies' disastrous Battle of Gallipoli. Despite popular support of Venizelos amongst the people, Constantine dismissed Venizelos as Prime Minister in October 1915 due to his increasing support for the Allies, and in his stead placed a succession of puppet premiers, all swayed by the King. Venizelos retired to Thessalonica where with the support of the Allies he established a provisional revolutionary government, much to Constantine's dissatisfaction. With civil war apparently imminent in 1916 Constantine sought, from Germany, firm promises of naval, military and economic assistance - without success. He left Greece on June 11, 1917 as he had to abdicate because of his pro-German sentiments and was succeeded to the throne by his second son Alexander as acting King. He went into exile to Switzerland. Alexander died on October 25, 1920 and, following a plebiscite, Constantine returned as king on December 19, 1920. He abdicated the throne again on September 27, 1922, following Greek military defeats against the Turks in Anatolia and Smyrna and was succeeded by his eldest son, George II. He spent the rest of his life in exile in Italy and died in 1923 at Palermo, Sicily. Princess Irene of Greece and Denmark (1904-1974), who married Aimone of Savoy, the 4th Duke of Aosta. This page was last edited on October 6, 2010, at 23:31.